Railmark has provided rail consulting, rail network design, rail network maintenance, rail operations and rail-centric logistics experience in over thirty-two countries. Railmark has created financially sustainable rail development plans for dozens of countries and rail systems around the world. Railmark maintains a network of international Trade Representatives. 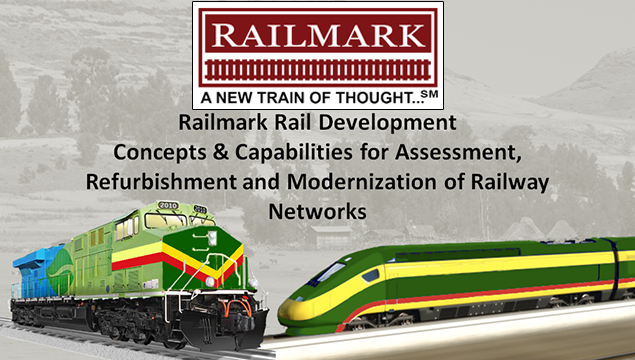 An accomplished provider of railroad and rail systems development, Railmark provides a full line of consulting and rail-improvement services to governments, municipalities and industrial clients located outside of the United States. Railmark's team of employees, associates and strategic partners work anywhere in the world. Our team of experienced international project management professionals have demonstrated experience in rail systems PLANNING, FUNDING, IMPLEMENTATION & OPERATIONS and uses the latest in rail technologies, rail business development and revenue strategies. Railmark's approach to its international rail projects is unique. Railmark's proprietary rail development economic model provides the means to quickly achieve both economic and social goals with a country's rail system. Railmark's modern rail systems technology complements other society needs such as renewable energy, communications and utility transmission. Railmark agrees that many organizations around the world can build railway systems, but Railmark's approach supports long term business and operational development and financial sustainability. Railmark's approach fully utilizes a nation's resources in rail development including human capital. Railmark's rail development programs will result in increased industrial and business development which translates into jobs creation and a growing economy. We invite you to contact us today to learn how Railmark can improve your international rail project and provide "A NEW TRAIN OF THOUGHT...®"
B. Allen Brown with the Hon. 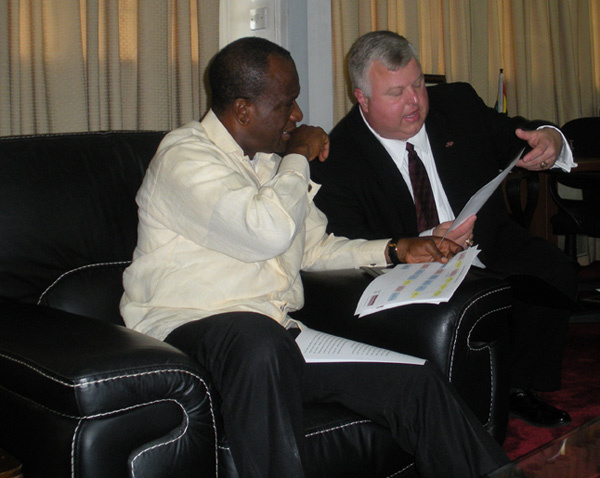 Mike Allen Hammah, Minister of Transportation for the Republic of Ghana, discussing Railmark's suggestions for Ghana's rail development program. © 1997-2019; All rights reserved by Railmark Holdings Inc.